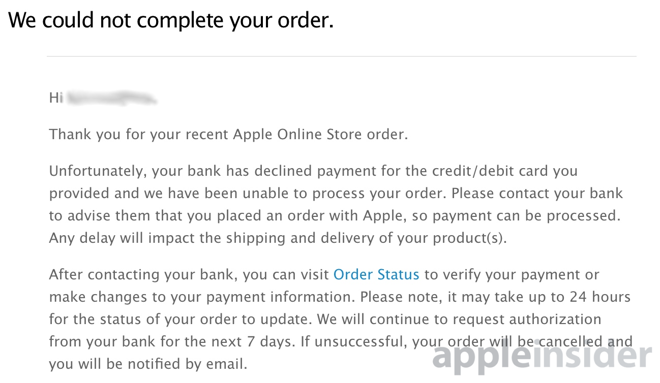 Readers who reached out to AppleInsider experienced a number of problems attempting to place their order for Apple's next-generation handsets on Friday. Things kicked off just after midnight Pacific, 3 a.m. Eastern, but initial customers were only able to access preorders via the iOS Apple Store app, and not through Apple's website on a traditional browser. And while U.S. carriers AT&T, Verizon and Sprint were accepting preorders, customers could not buy a handset for T-Mobile, directly from the carrier or through Apple's website, for hours Friday morning. That also affected AT&T customers looking to buy a no-contract, no-subsidy unlocked handset compatible with AT&T's network. Apple's issues connecting with carrier partners overnight led the company to give temporary reservation numbers to affected customers. Those people began receiving emails on Friday notifying them that they have 24 hours to complete their order, or they will lose their place in line for their purchase. For those that did manage to get orders through, other problems occurred. A number of people indicated that their credit card rejected their new iPhone purchase after Apple placed a one-dollar authorization charge on the card in addition to the full cost of the phone. Efforts to re-authorize the charge also proved problematic thanks to the crushing demand Apple's website and phone systems were experiencing. Attempts to visit the "Check Order Status" of Apple's online store returned an error page reading: "We're sorry. Something went wrong with your request. Please try again later." Apple has told people with rejected credit cards that they have up to a week before the order will be canceled. And Apple's default 1-800 number was experiencing similar problems, simply hanging up on callers attempting to check on an order after informing them that the company was experiencing "expectedly high call volumes." 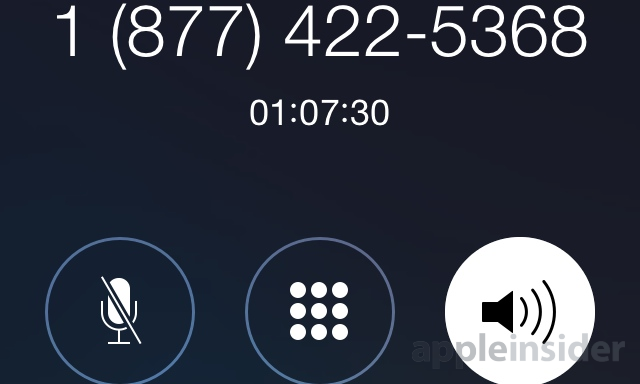 Those who could get through on Apple's toll-free number were met with extremely long wait times before reaching a customer service representative. A number of AppleInsider readers also expressed frustration that they woke up overnight in an attempt to preorder the 5.5-inch iPhone 6 Plus, but were unable to do so because of technical glitches. Then, when they woke up later Friday and made another attempt to purchase, they discovered that launch-day inventory is sold out, and new orders are scheduled to ship more than a month after Sept. 19. One reader said they placed an order for a gold iPhone 6 Plus Friday morning and were quoted a shipping time of two to three weeks, but once they received their confirmation email, it indicated the unit would not ship for five to six weeks. Of course, issues when attempting to preorder Apple's latest iPhone are nothing new, as every year the demand for the company's latest model only grows. Server meltdowns, error messages and technical glitches have become par for the course for Apple and its carrier partners once the flood gates open.